In the following article Stephen Crosby, a real theologian if you don’t know him, does a masterful job of explaining how we got into this mess and gives us the solution for the illness. The only thing left for us to do is to ask God’s forgiveness and turn our hearts to practice what we already know. This can’t be done in a hour and half service once a week, but for those whose hearts are set on pleasing God, it will become a 24/7 lifestyle. May the Lord give us grace to hear, and may His Spirit not turn us loose till we obey. The body of Christ is the result of Jesus’s life, death, resurrection, Spirit-outpouring, and Spirit-indwelling: the new creation. The Bible is the product of the Holy Spirit working in and through the body/church. In a historical sense, not a metaphysical one (the Church is eternal, as is the Logos), there was a community before there were writings. The writings came out of the experience of the community and the need to objectively capture the transmission of the apostolic proclamation of Christ for future generations. I am thankful for my heritage. By the grace of God, I have been devoted to Jesus as revealed in the scriptures for 40 years. To the best of my ability, I have given my life to the disciplined study, honest exegesis, and honorable application of the scriptures. I am not anti-scripture. I am anti-ignorance and anti-nonsense. Respect for, or worship of . . . 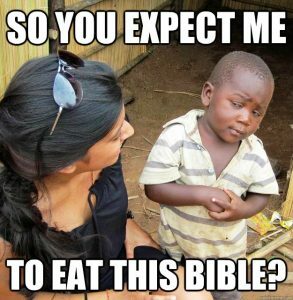 The Bible? Bypassing for now the history of shameful bloodshed and other egregious misbehavior associated with some of the personalities involved in the Reformation, there is yet another downside consequence which is more contemporaneous. It’s the risk of bibliolatry: the worship of the Bible. Evangelicals and Fundamentalists would vehemently deny that this is an issue in their spheres, but it is a very present and serious issue. The scriptures declare that the world is not waiting to be persuaded from the Bible. [ii] The world does not care about our “Bible” and our opinions about it. The scriptures tell us that the unbelieving world has a right to “taste” of us,[iii] to savor us,[iv] to see if the aroma of Christ[v] is present or not. The world is waiting to see a quality of life manifested on earth. [vi] The scriptures exist to reveal Jesus Christ for who He is, and to serve these ends. If we master the content of the scripture and have no savor or aroma of Christ, we are like a man holding a legitimate ticket, but who has missed his boat. It doesn’t matter how factual your ticket is, how everything on that ticket is true, how well you can explain the ticket, and defend its veracity. It exists to serve a purpose and you have missed it. Truth has always had a Body. [vii] All Christian truth is incarnational (embodied). The correct apprehension of biblical facts is not the same as possessing the life of Christ. It’s possible to flawlessly explain Paul’s theology and possess none of his life. The church, the ekklesia, is supposed to be the pillar and ground of all truth. That does not mean it is to a library for the accumulation of scriptural knowledge. It means that in the Body, Jesus is to be seen. Without beans you cannot have a cup of coffee, but with just beans you still don’t have coffee! You have the potential for coffee. Disciplined study of scripture is like a cup of beans: necessary, but not the end of the matter. Scripture study is like charcoal. Without it, you won’t have a barbecue. But just having charcoal is not enough for a barbecue. The potential for heat and light that is in the charcoal must be ignited. It is our being knit together in love that turns beans to coffee and charcoal to heat and light. That their hearts might be knit together in love and UNTO all riches of the full assurance ofunderstanding, to the acknowledgment of the mystery of God, and of the Father, and of Christ, in whom are hid all the treasures of wisdom and knowledge. Bible study can be intellectually intoxicating and lacking social context. Living well together in Christ is crucifying. There is more to our faith than the accumulation of teachings and a pursuit of “deeper understanding,” erroneously often called “revelations.” I am not interested in novelty for novelty’s sake. I am not introduced in esoteric speculations from the scripture. I would like to live well in the sure things from scripture that I already understand. Mark Twain once said that he was not so much bothered by what he did not understand about the Bible, but by what he did understand! Me too. Jesus said: By this all men will know that you are My disciples, if you have love for one another. This is to be the outcome of our commitment to scripture. We are the One Loaf the unbelieving world is permitted to “bite into” to taste and see if God is good . . . or not. [xvi] If our commitment to scripture does not result in an appropriate taste, our ship has sailed without us. [i] Not the least of which is: “Who reforms the Reformers?” Every group thinks they have the last word from God – a fundamentally intoxicating proposition. [vi] Rom. 8:19, 2 Cor. 4:10-11. [vii] John 5:39-42, John 14:6, 1 John 1: 1-3. [viii] A. W. Tozer, Keys to the Deeper Life, 1957. [ix] Paul Tournier. The Healing of Persons. New York: Harper and Row, 1965, 42. [x] Peter Leithart. Against Christianity. Moscow: Canon Press, 2003, 16. [xii] In the sense of utility for kingdom purpose, not in the sense of His affections.